Below some standard scintillation detector assemblies are presented. 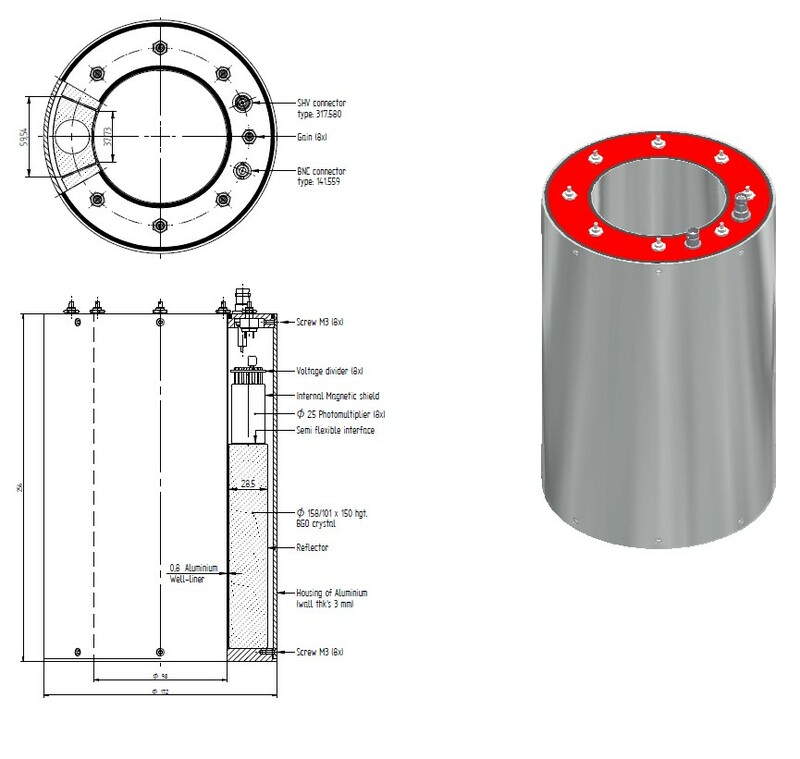 SCIONIX C-style detector assemblies basically consist of a scintillation crystal which is machined and mounted in a housing of aluminum, stainless steel or copper. 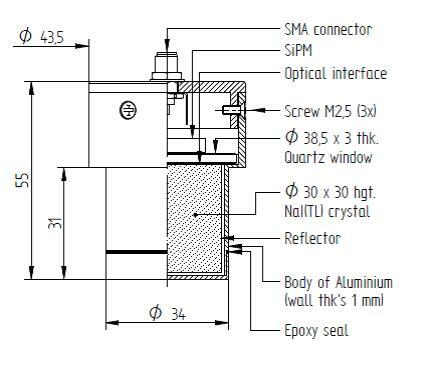 In case of hygroscopic crystals the assembly is sealed by a glass or quartz window for optical coupling to a photomultiplier tube or other light detection device. A C-style assembly can be manufactured from low background materials (LB steel or copper). 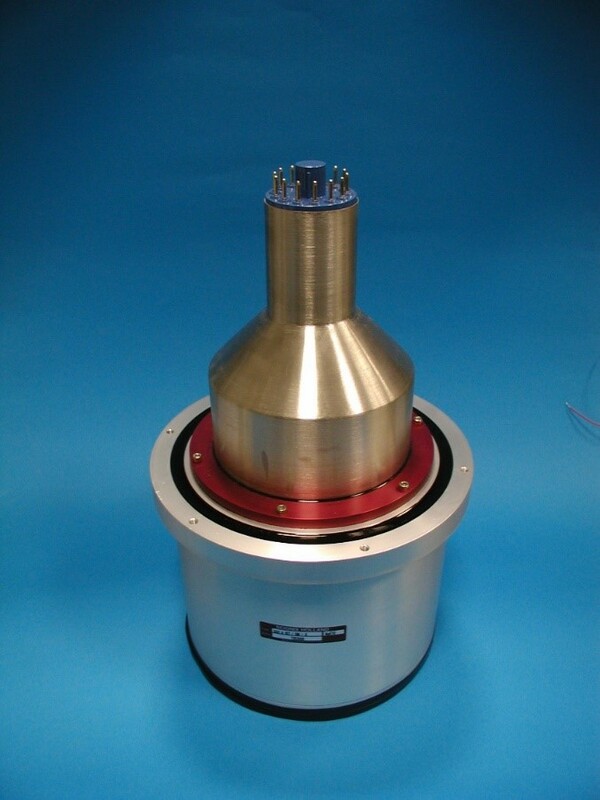 C-style assemblies are intended for use in combination with customer’s photomultiplier tube in demountable assemblies. The optical contact to the PMT is accomplished by using optical coupling compound or customer’s own optical glue. 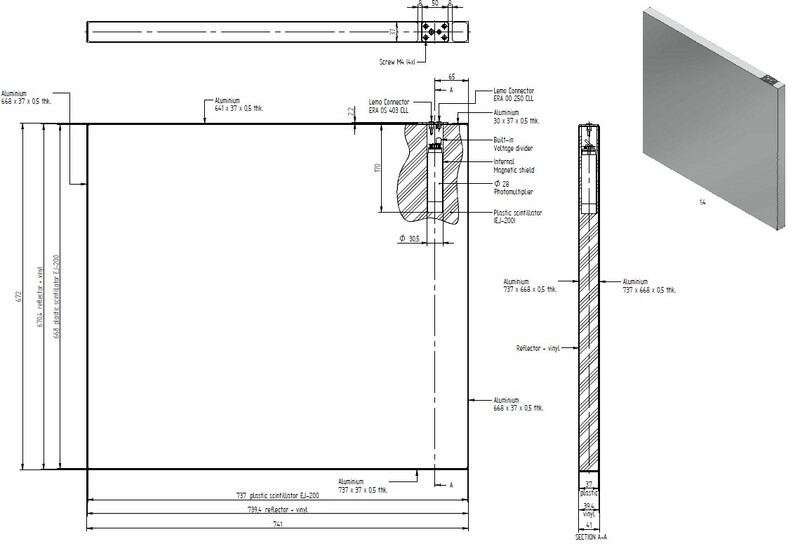 C-style assemblies can be provided with an axial well called CP styles, or with thin (25 μm thick) aluminum entrance windows at the flat side of the crystal called CA styles. 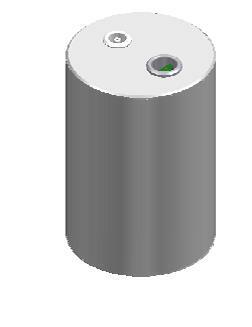 The standard thickness of an aluminum housing is 0.5 mm, that of a stainless steel housing (harsh environments) is 0.8 mm. 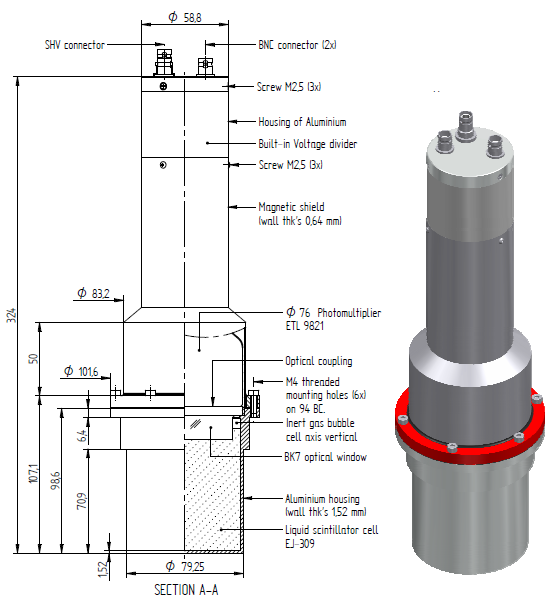 C-style assemblies can be provided is ruggedized version (CR styles).Housings can be equipped with flanges or grooves for O-rings in order to facilitate a demountable coupling to the PMT and its housing. 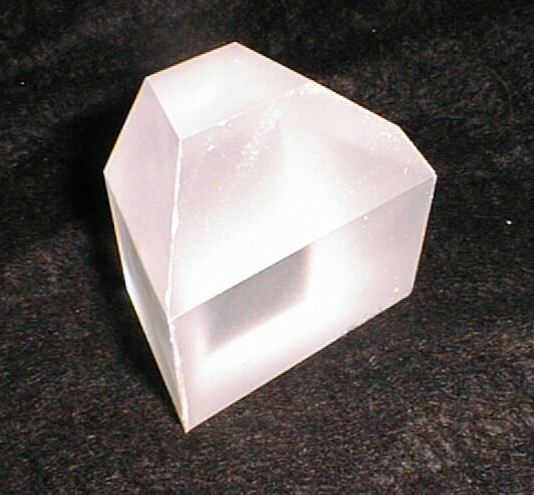 The optical window can be extended in height or tapered to form an optical light guide to a different diameter than that of the crystal. For optimum energy resolution, the diameter of the crystal is chosen equal or slightly smaller than the diameter of the PMT. 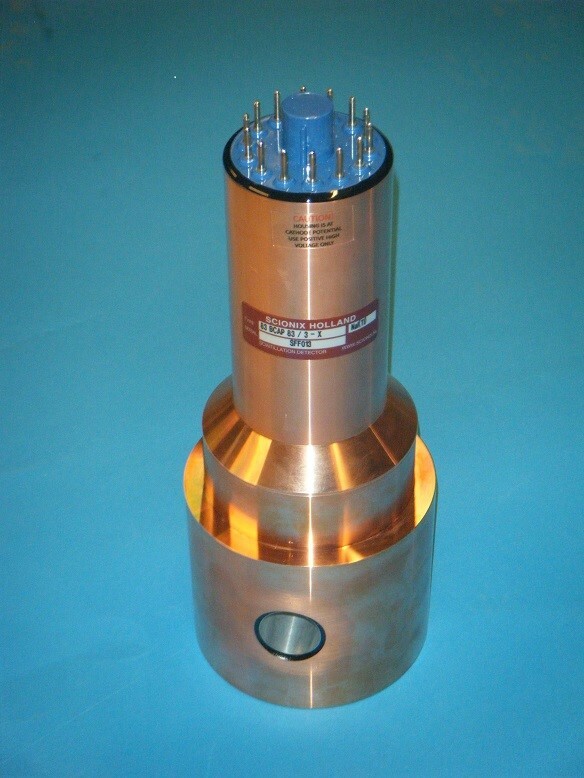 Standard C-style assemblies are used for detection of gamma-rays and X-rays between 30 keV and 2 MeV. For higher energies, BGO can be chosen as the scintillator of choice in which case the optical window is omitted. CP-styles are used in well counters for e.g. medical applications or wipe test detectors. 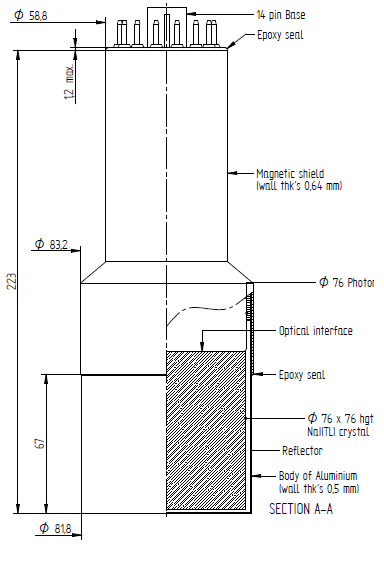 For the detection of low energy X-ray radiation, a detector can be made intrinsically insensitive to higher energy radiation by choosing the scintillation crystal only a few mm thick. For optimum energy resolution, also at very low (several keV) energies, NaI(Tl) scintillation crystals are often used. For transmission of the radiation of interest, 25 μm thin Aluminum (Al) windows or 0.25 – 0.3 mm thick Beryllium (Be) windows are used. Al windows are suitable for energies down to 10 keV whereas Be windows can be used down to 3 keV. The advantage of Al windows is their low cost but Be windows are less easily damaged. 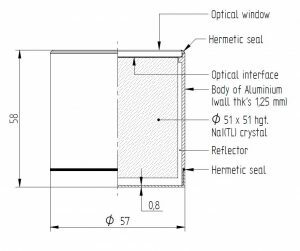 For non-hygroscopic crystals, aluminized mylar entrance windows or titanium foil windows can also be used. Detectors with photomultiplier tubes exist basically in two versions : demountable called A-styles and integrated called B-styles. 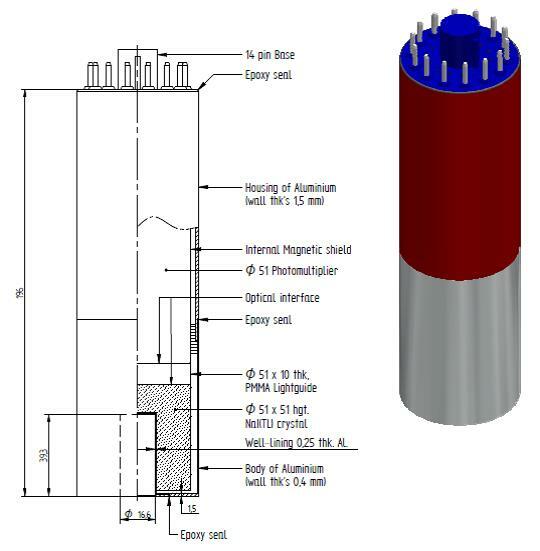 Scintillation detectors with integrated photomultiplier tube(s) consist of a scintillation crystal, coupled directly to a photomultiplier tube with a slightly flexible, high refractive index optical coupling medium. 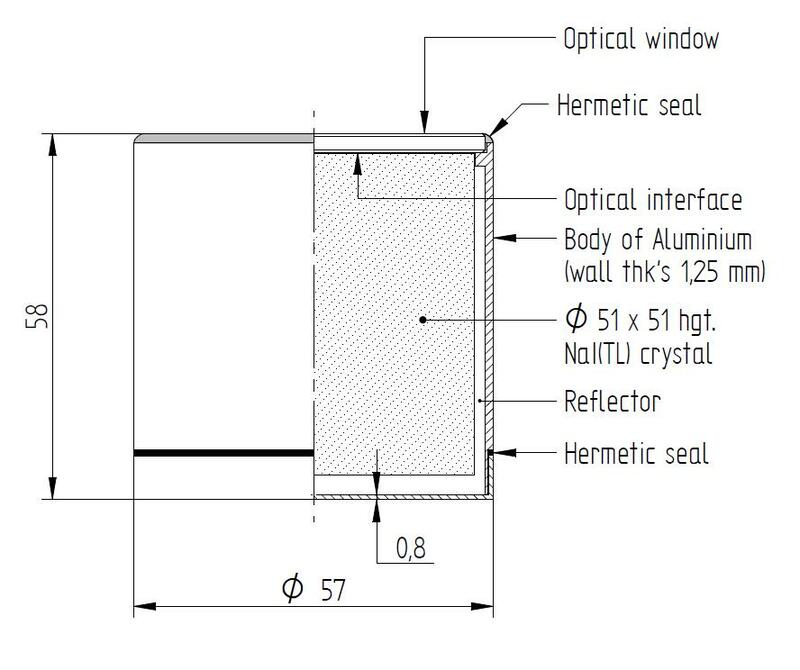 The crystal and PMT are hermetically sealed (gas tight) in a light-tight housing with an aluminum or beryllium entrance window. 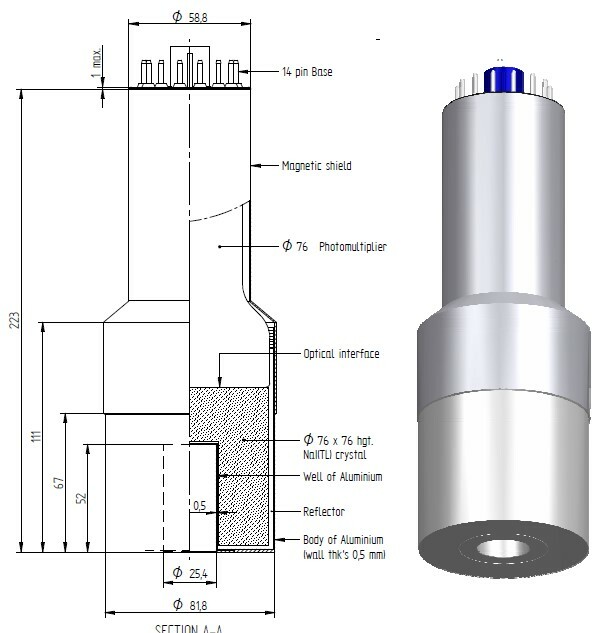 Detectors have either an internal or solid external μ-magnetic housing around the PMT and can be supplied with 12, 14 or 20 pins connectors to connect to a plug-on Voltage Divider or with a built-in voltage divider (see the section on electronics). One of the most frequently used scintillation detectors world-wide is the 76 x 76 mm NaI(Tl) detector (SCIONIX type 76 B 76 / 3M) which is THE scintillation detector standard for general gamma spectroscopy having excellent efficiency and energy resolution. For low background (LB) applications, B-style assemblies can be supplied in low background steel or electrolytic copper housings. All detector components can be selected on the lowest possible radioactive background. 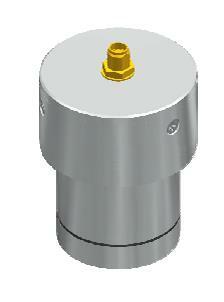 In LB units, quartz or undoped NaI light guides are used to reduce the background from the PMT. 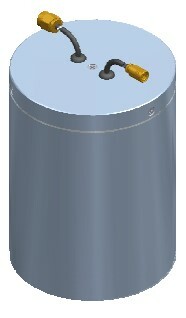 Below some standard B-style detectors are shown as well as an example of an assembly equipped with an axial well (BP style). Many other PMT diameters are possible. 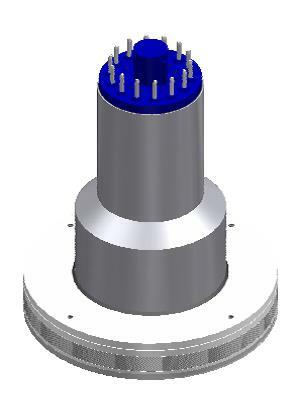 Standard PMT diameters are : 10, 13, 19, 25, 28, 38, 51, 76, 90, and 127 mm. For the detection of low energy radiation, thin scintillation crystals are combined with PMTs in a thin-window assembly. For the detection of X-rays > 10 keV, 30 μm thick Aluminum windows (BA styles) are used. 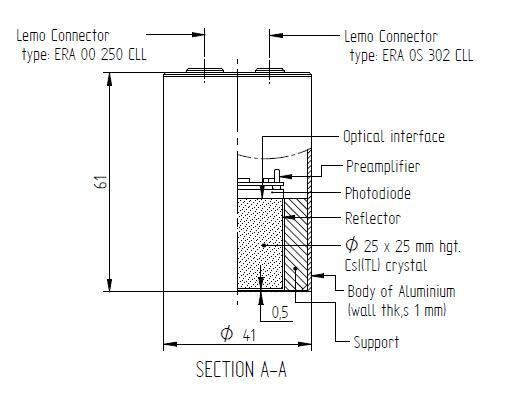 For lower energies, the BD-style with a 0.2 or 0.3 mm thick Be window is the detector of choice. BM is the notation for a thin mylar entrance window for the detection of heavy ions of low energy β-particles with non-hygroscopic crystals. The thickness of the above materials is not fixed and can be modified to your application. Thin window B-style assemblies are often constructed with light guides to compensate for local inhomogeneities in the response of the photocathode of the PMT. 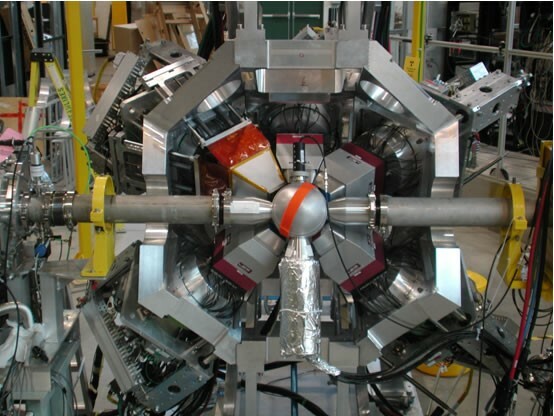 Detectors with more than one PMT are often constructed as demountable assemblies. 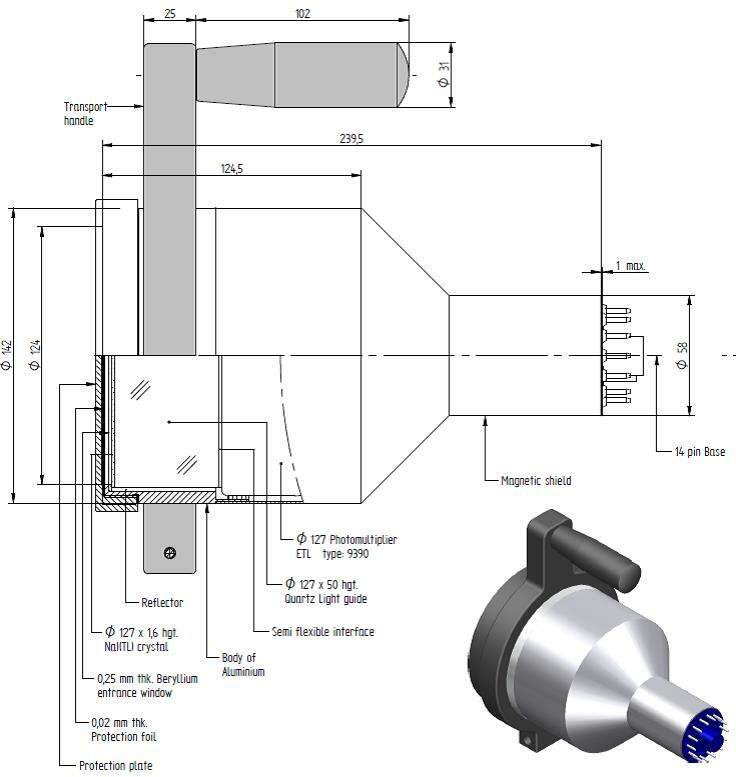 The advantage is that in case of break-down of one PMT, it can be replaced easily by the user without having to take apart the entire crystal assembly. Especially for complicated detectors such as Anti-Compton shields or large whole body counters, this is the normal approach. 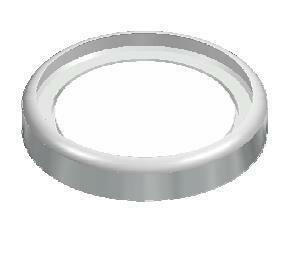 A-styles are also available with axial well (AP-style) or thin entrance window AA-styles. All liquid scintillators are hermetically sealed from ambient air. 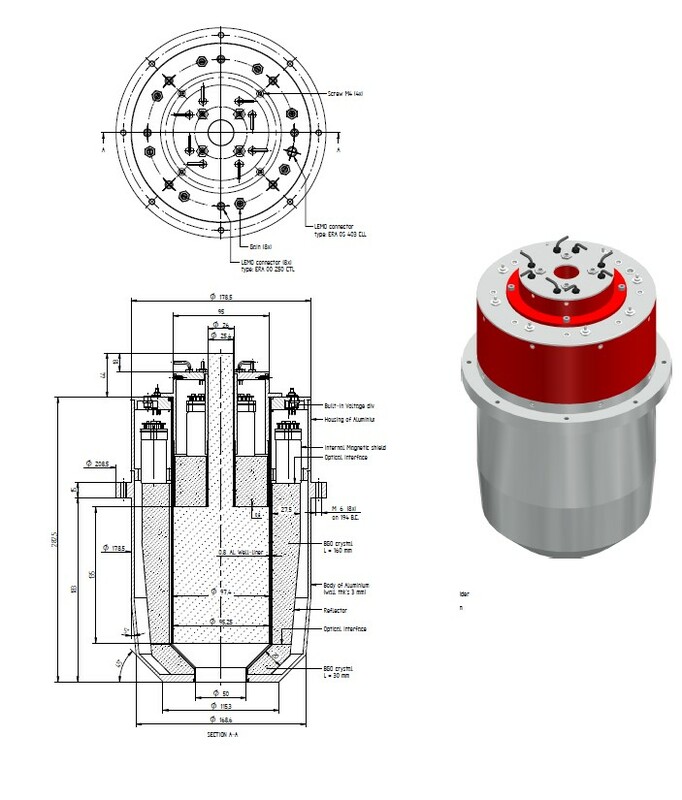 Liquid scintillators exhibit more thermal expansion than inorganic scintillators and every liquid scintillation cell needs an expansion reservoir. SCIONIX has developed a construction that guarantees 100 % optical contact between the liquid and the optical window under all orientations of the cell. Voltage dividers operated at negative high voltage. Solid organic scintillators exist in many varieties. What they have in common is that they consist of mainly carbon and hydrogen atoms and have therefore a relatively low density (roughly 1 g/ cc) and a low Z value. 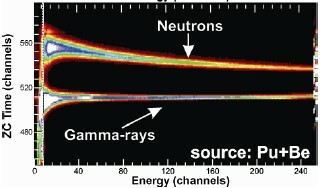 This means that interaction with gamma-rays is for the largest part via Compton interaction which explains the absence of photo-peaks in the energy spectrum. Spectroscopy with organic scintillators is therefore challenging. This means that plastic scintillators are mostly used for gross counting not for spectroscopy. PolyVinylToluene (PVT) based and PolyStyrene (PS) based scintillators are called “plastic scintillators”. 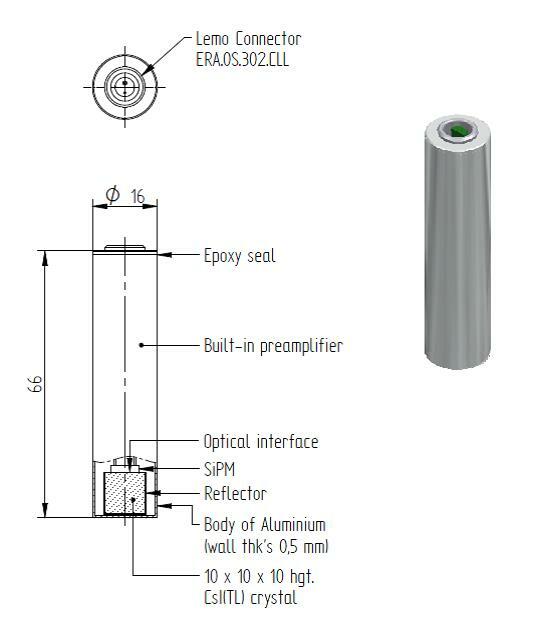 In the ELJEN part of the SCIONIX web site a detailed description of the available plastic scintillators can be found. Here we just mention briefly some important characteristics. The main reason to choose plastic scintillators is their low cost and the fact that they are available in very large sizes (meters long). 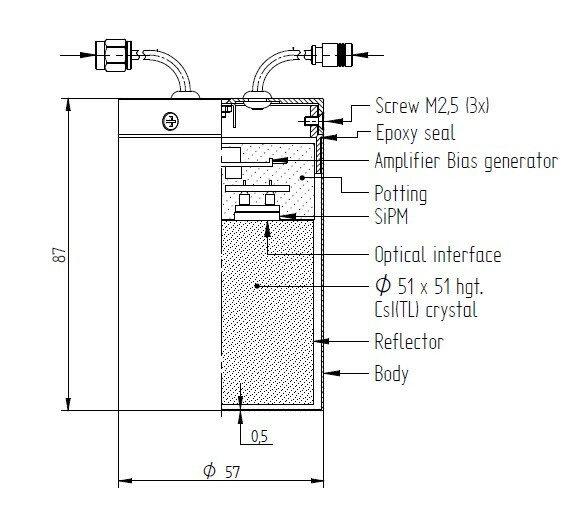 In general plastic scintillators emit between 8.000 and 12.000 photons per MeV gamma rays and the maximum of their emission is around 420 nm. When a wavelength shifter is added to the material, the maximum of the emission is shifted to about 490 nm. This can be advantageous for readout using silicon based devices (photodiodes, APDs, some SiPms). The above means that plastic scintillators are mostly used for gross counting not for spectroscopy. Due to their large size choices have to be made for the way the scintillation light is read out. Sometimes multiple PMTs are needed to detect signals above the noise but this totally depends on the actual application. 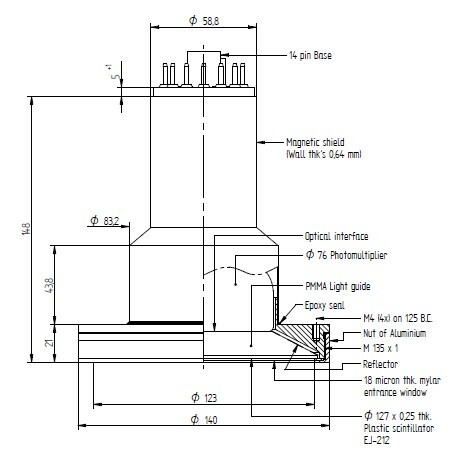 Since cosmic muons deposit several MeV per cm of material, the readout requirements for muon shields are less stringent than for other applications and small PMTs embedded inside the plastic scintillator are often used. 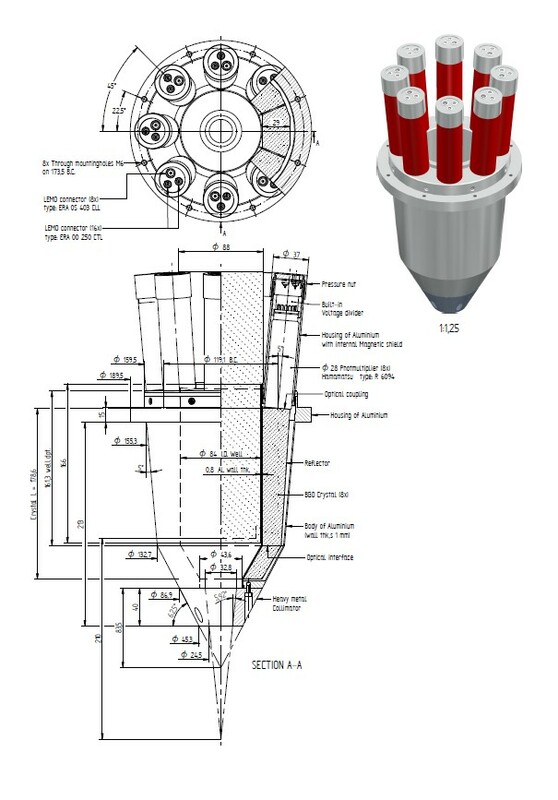 Muon shields are used to reduce the background of Shielded HpGe detectors and are in practice always “custom designed”. 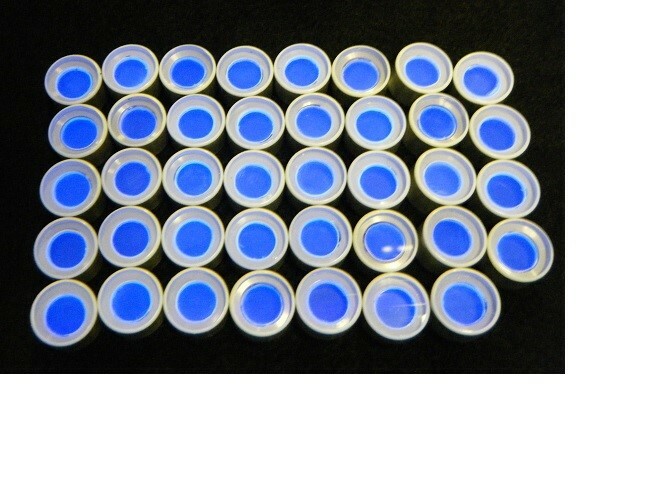 Thin( 0,25 mm thick) plastic scintillators coupled to PMTs can be used for low background detection of beta particles in the presence of gamma rays. The entrance window is usually aluminized mylar. 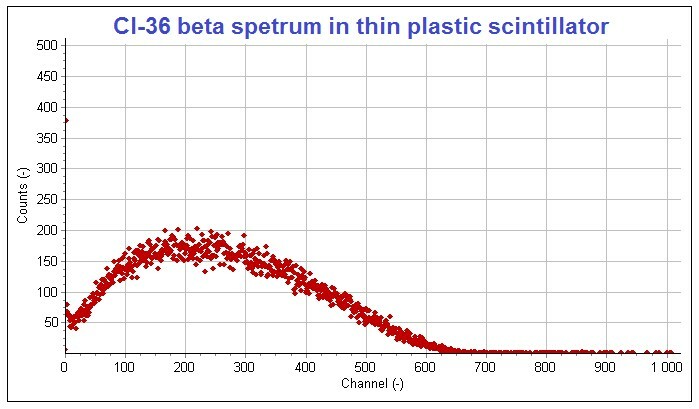 Plastic scintillators can be read out by SiPms but the signal-to-noise ratio should be considered carefully and sometimes signal coincidence electronics is required. Stilbene (C4H12)and Antracene C4H10 are solid organics crystals that have recently gotten some more attention due to their excellent neutron / gamma discrimination properties. SCIONIX offers these materials in conjunction with PMTs and SiPms. The advantages and limitation of photodiode detectors were discussed in a previous section. 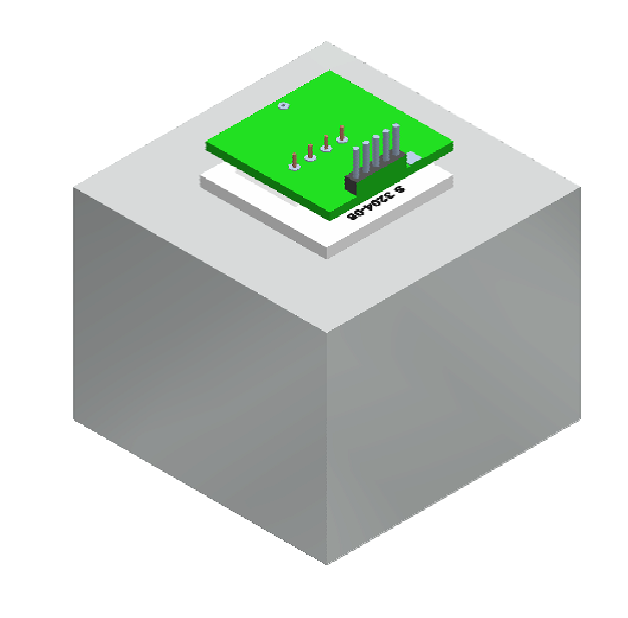 In general, photodiode scintillation detectors consist of a small PIN photodiode, integrally coupled to a scintillation crystal, often CsI(Tl). As a standard rule, a charge sensitive preamplifier is incorporated in the assembly. 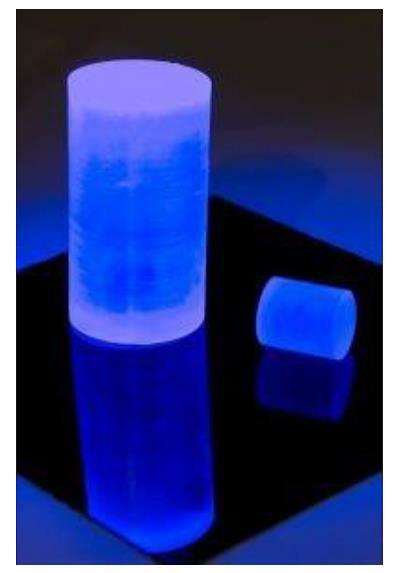 CsI(Tl) crystals do not crack or cleave and photodiodes are shock resistant. Many configurations are possible. The noise level and energy resolution of the detector depend very much on the crystal/diode configuration. Contact SCIONIX for your specific requirement. The noise of photodiode scintillation detectors increases with temperature. Above 50 oC these instruments are not advised. An important application of photodiode detectors is in physics research for the detection of charged particles. 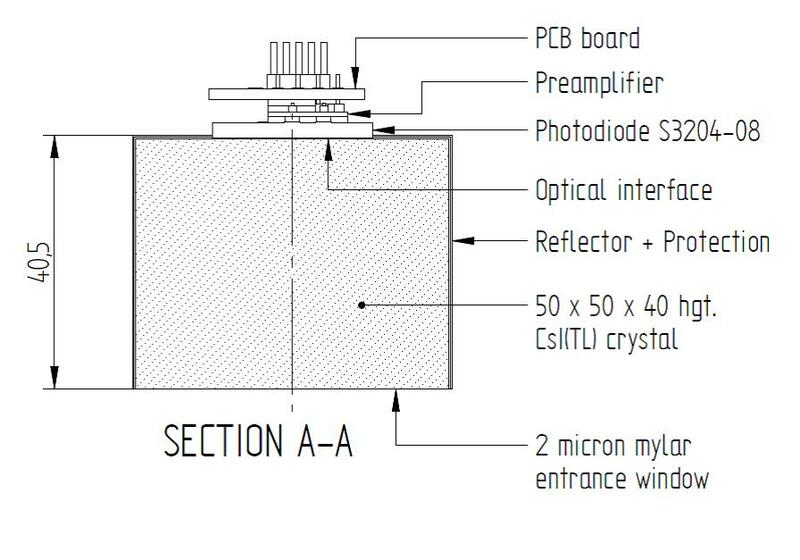 A thin silicon detector is placed in front of a CsI(Tl) crystal read out with a photodiode to perform an E / ΔE measurement. SCIONIX offers built-in a (first order) temperature compensated bias generators / preamplifier in conjunction with the SiPm / scintillator combination. 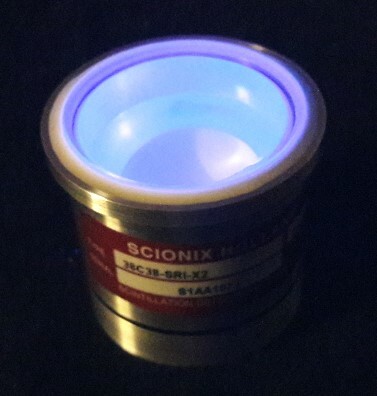 In fact, many SCIONIX scintillation detectors are specials with detector configuration and materials adapted to the specific requirements of the user. Among the special applications we would like to mention here anti-Compton shields, and phoswhiches. 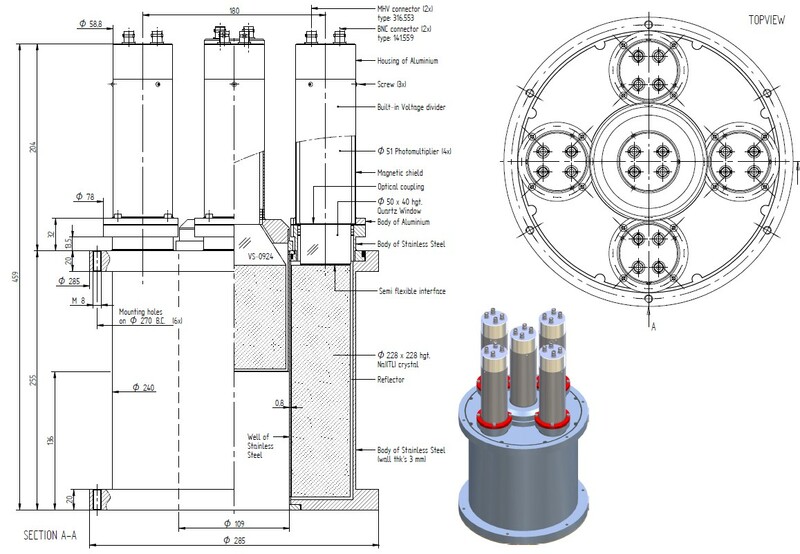 Compton Suppression systems are scintillation detector assemblies mounted around a High Purity Ge-detector (HPGe) that detect the gamma rays Compton scattered by the Ge crystal and generate a veto signal when such a Compton event occurs. This improves the peak-to-total ratio in the pulse height spectrum of the Ge detector significantly. 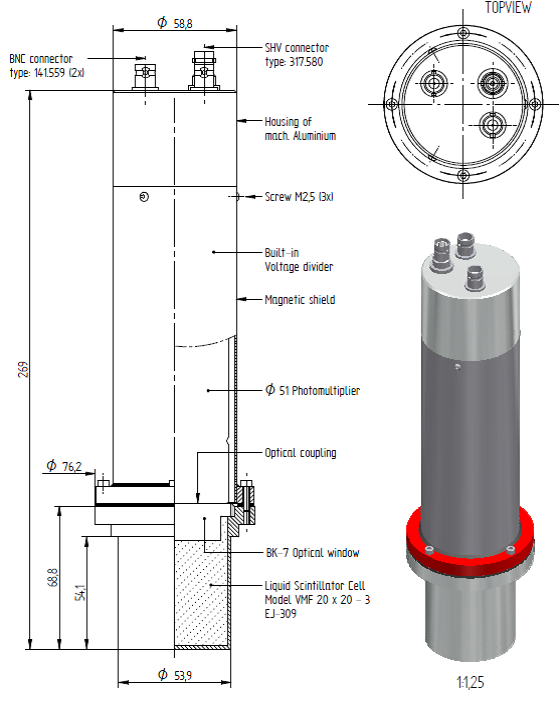 Crucial parameters are a large solid angle coverage around the HPGe detector and high stopping power. 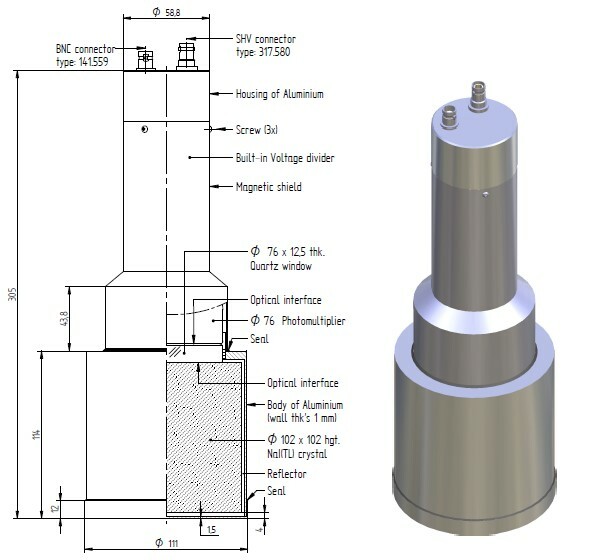 The use of segmented well-type BGO detectors is the generally accepted optimum approach, except for low background systems where the intrinsic high background of BGO is prohibitive and NaI(Tl) is normally used. Another very important parameter is the lowest (Compton scattered) X-ray energy that can be detected. For optimum suppression one should be able to distinguish 15 keV from the noise. Below some examples are shown. 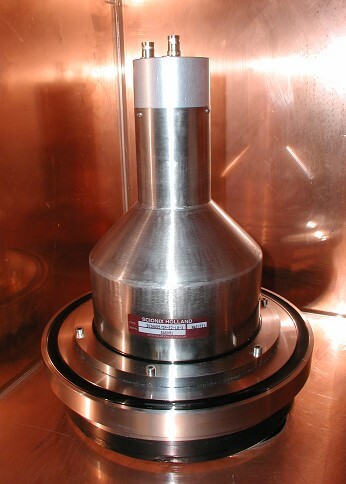 Compton suppression shields can be provided with special backcatcher detectors around the cryostat arm for optimum solid angle coverage. 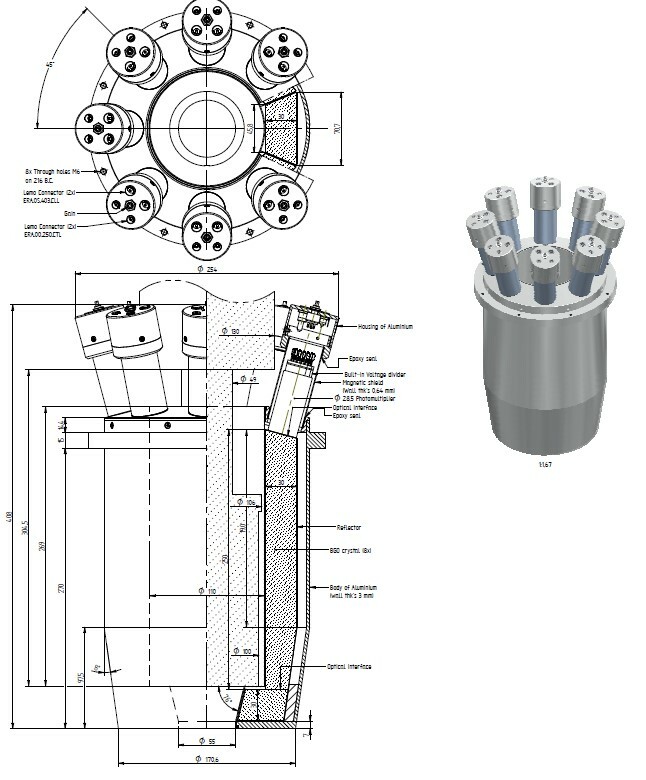 Many options are possible and we advise to contact SCIONIX to discuss the optimum configuration for your HpGe detector assembly. 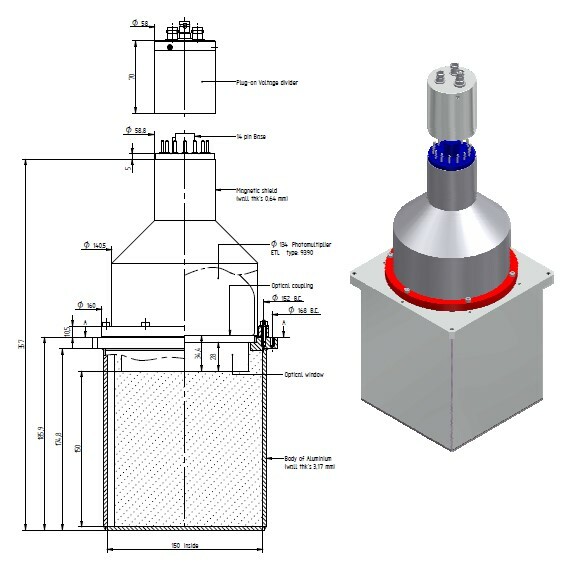 Phoswiches are detectors employing a combination of two different scintillation materials. The application is low intensity detection of X-rays in the presence of a gamma-ray background. 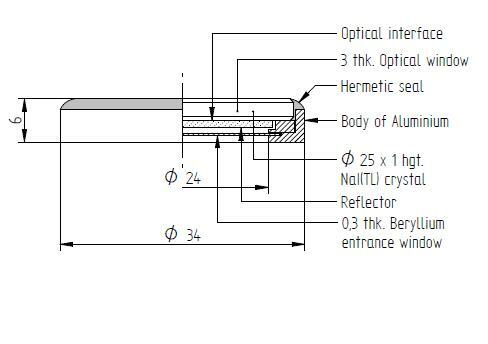 The (thin) primary scintillation crystal detects the radiation of interest and the secondary (guard) crystal detects background absorptions in the guard crystal and radiation that is scattered by the primary crystal and is absorbed in the guard crystal. This last aspect implies that by setting a veto in case of a time coincidence in signals between primary and guard crystal, the background contribution from the primary crystal can be reduced. Both primary and guard crystal are read out with the same PMT. Whether a signal in the PMT originated from the primary or the guard crystal is determined by choosing scintillation materials having different decay times. Important is that the primary crystal cannot excite the secondary one optically. The most frequent combination is a NaI(Tl) and CsI(Tl) phoswich (effective decay time 0.27 μs and 1 μs) for low energy X-ray detection. Signal separation is done by (digital) pulse shape discrimination for which it is important that the decay times of the two scintillators are sufficiently different. 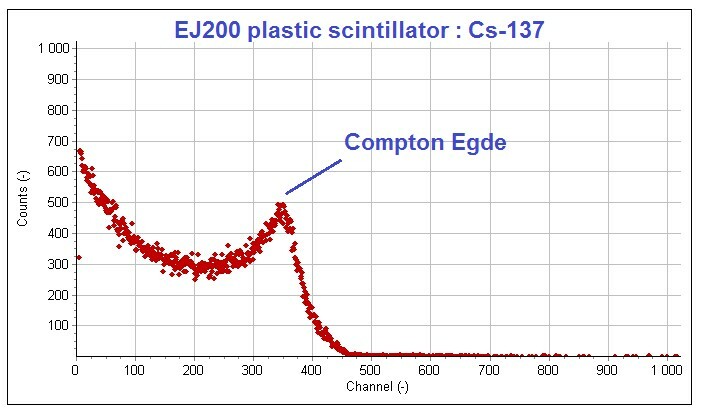 Another classic example of a phoswich is the use of a ZnS(Ag) coated plastic scintillator in alpha/ beta detection (EJ444). 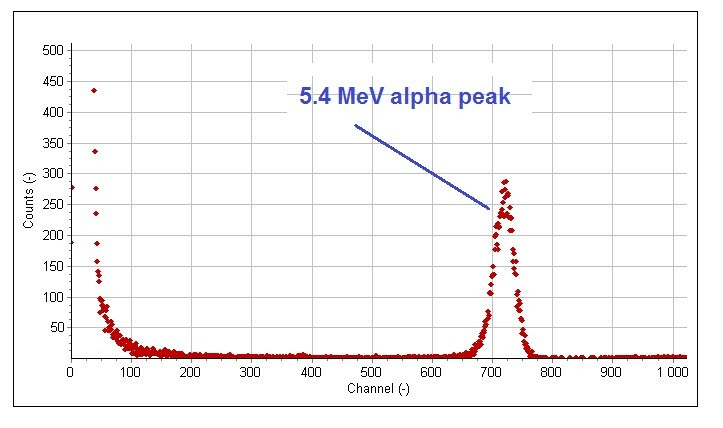 Alpha particles are stopped in the thin ZnS(Ag) layer producing pulses with a decay time of approximately 100 ns whereas beta particles that loose energy in the plastic scintillator produce pulses with decay times of the order of a few ns. Also other combinations of crystals are possible like CeBr3 and NaI(Tl) crystals (decay times 23 ns versus 270 ns) in physics experiments.